Stand and Fight and Win a Ruger 1911 with Custom ISAA Grips! As the fake news media spews lies day-in and day-out, they’re dumping fuel on the anti-gun Left’s hatred for everything America stands for. While the Left launches destructive riots, shoots cops in unprovoked attacks – and just months ago attempted to shoot up President Trump’s Miami golf resort -– media elites constantly make excuses for them. Instead, they blame you and me for daring to stand up for ourselves! If freedom in America is to survive, you and I must continue to stand together against this constant swarm of attacks. Today, gun-grabbers are more emboldened than ever, believing that the Parkland, Florida and Santa Fe, Texas murders and the mad rush to gun control which ensued, Second Amendment supporters like you and me will just be too disillusioned to even bother showing up at the polls in November! I’m counting on you to help me prove them wrong, wrong, wrong. As you’ll see, I’ve prepared a special Second Amendment Turnout Pledge, letting me know you’re not going to just sit on your hands in November -– and instead vote to hold gun-grabbing politicians accountable. Will you please sign and submit it back to our office at once? If you do, your name will be entered to win a special Ruger 1911 with custom ISAA grips on Monday, October 15th! The 1911 has been used by our great military for over 100 years and is one of the most iconic handguns in America! And if you can possibly make a contribution of $35 or more, I’ll rush you our Idaho Second Amendment Alliance member T-shirt! As you may know, the Idaho Second Amendment Alliance is exposing gun grabbers at every level of government. This gun giveaway helps us quickly determine how dedicated our supporters are to standing with us. So please sign your Second Amendment Turnout Pledge RIGHT AWAY! As you know, mid-term elections are often decided by turnout. Gun-grabbers and their pals in the media believe they have the advantage. So all over the country, Michael Bloomberg and his anti-gun pals are pushing a constant barrage of anti-gun attacks -– from Gun Confiscation Orders to so-called “Assault Weapons” Bans. *** REPEALING CONSTITUTIONAL CARRY: Idaho gun owners fought hard for Constitutional Carry and we aren’t going to let gun grabbers remove this historic victory! *** INSTITUTING SO-CALLED “UNIVERSAL BACKGROUND CHECKS,” which is nothing more than code for STATEWIDE GUN REGISTRATION. And registration is always just the first step toward CONFISCATION. *** GUN BANS FOR SIMPLE MISDEMEANORS to begin their push for “Red Flag” laws in Idaho. I hope you agree we cannot allow this madness to happen. Instead, we have to FIGHT BACK now -– before it’s too late. >>> Second, please agree to your most generous contribution. 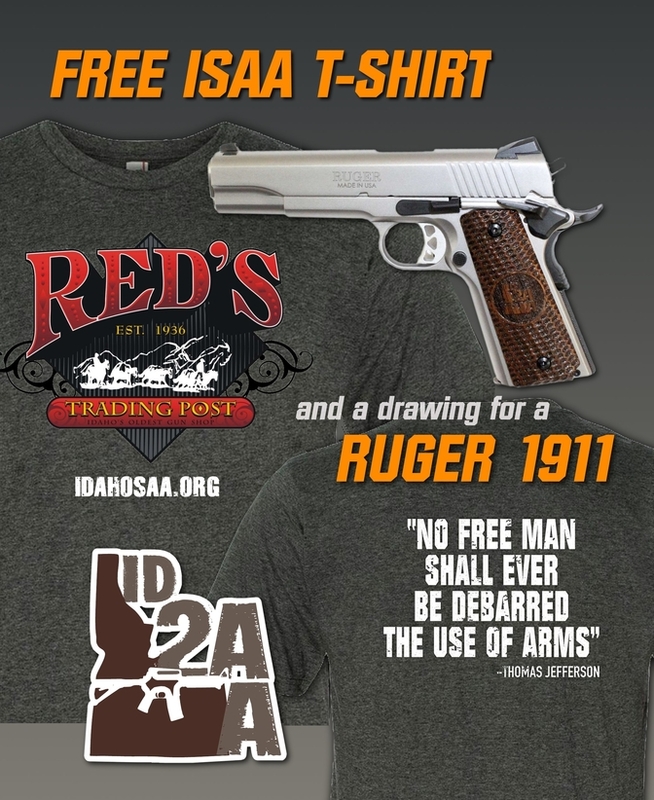 If you can give $35 or more, I’ll rush you a Idaho Second Amendment Alliance T-shirt. But my hope is that you’ll agree to $100 or $50. Or, if that’s too much, please just give whatever you can afford. Your generosity will be a big help to our election year plans, which are already being put into action. Please understand that you’re a critical part of the Idaho Second Amendment Alliance’s winning team. But there’s more at stake for Idaho this year than ever before. So please sign your petition right away -– and consider your most generous contribution of $100, $50 or whatever you can afford today! P.S. Will you please sign and send in the Second Amendment Turnout Pledge that we’ve prepared for you? If you do so, your name will be entered to win a special Ruger 1911 with custom ISAA grips on October 15th — the same gun used by our military for over 100 years. And, if you can possibly make a contribution of $35 or more, I’ll rush you an Idaho Second Amendment Alliance T-shirt! 2,000 Idaho Gun Owners March On Capitol! Pocatello Anti-Gun Politician’s Record Needs Exposed!